After the recent lost against Iran in the 2014 Asian Games, Gilas Pilipinas will not end their dreams to fight for our countries pride. They will face the Qatar team today, September 26, 2014 at exactly 5:30 pm (PH Time), as the start of quarterfinal round. As they move to the quarterfinal round, Gilas team are confident to win this game because last year on 2013 FIBA Asia Championship they always win against Middle Eastern nation. Gilas Pilipinas was defeated by Iran by 5 points (63-68) yesterday at the Hwaseong Sports Complex in Incheon, South Korea. We will keep you updated blow by blow once the game started, just refresh the page as often as you can. 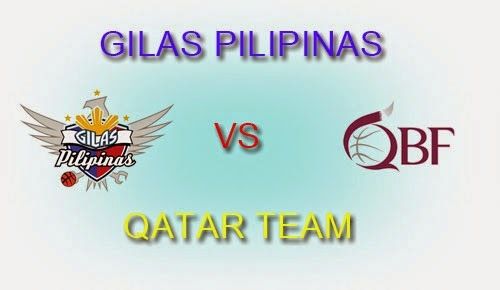 Gilas Pilipinas defeated by Qatar in 9 points (77-68) . Tomorrow is their battle to the host of Asia Games 2014, "South Korea." They must win this game so they have chance to get the Gold Medal. And please bookmark this page and share to your joined social networking sites. Comments or suggestions about "2014 Asian Games: Gilas Pilipinas vs Qatar Game Results, Highlights & Video Replay" is important to us, you may share it by using the comment box below.